Using the name Holmes, singer/songwriter/producer Roy Shakked released an unmissable covers album – the appropriately titled ‘Covers’ – back in 2011. The following years found him disappearing into a busy schedule of work: a full length album of originals appeared in 2012 and following his relocating to Israel, by 2015, he was became a member of a new band The Bright Wild. Roy’s music continued to be hidden in plain sight over the next couple of years with his compositions appearing on numerous TV shows and adverts in the US and his need to create new sounds eventually yielded a new solo EP in December 2017. 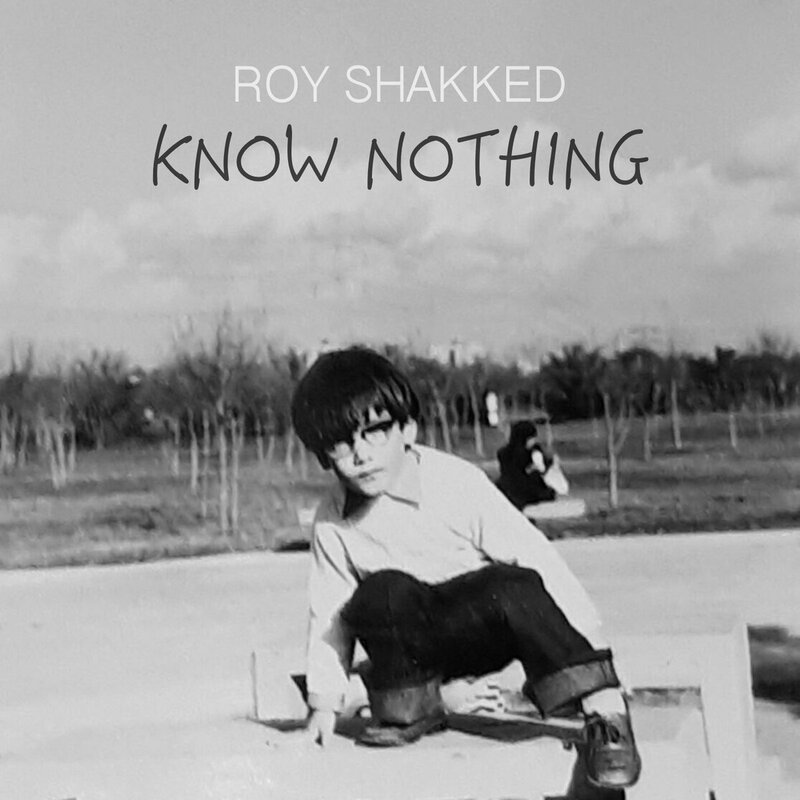 ‘Know Nothing’s five tracks have been created with the same attention to detail and loving care as his prior records, although some of the material feels a little moodier. This isn’t especially a bad thing and, in the case of the EP’s instant stand out, ‘I Wait’, such downbeat vibes work exceptionally well. With a sparse, waltzing piano motif, the track takes hold immediately with its very old soul. The simple music, especially when augmented with bells and a warm bass, evokes the adult pop of McCartney circa ‘Chaos & Creation In The Backyard’. All the while, Shakked’s voice aches with a sadness that would suit latter day Eels records if Mark Everett had more of a singing style. The warmth of the bass gives the arrangement a real sense of intimacy, but it’s a slide guitar that leaves the lasting impression. Adding a very slight country vibe, the slide work is incredibly mournful but also completely sympathetic to the rest of the instrumentation. In terms of adult pop, this…this is marvellous. ‘I Lost Myself’ is a terrific slice of indie-folk, with finger-picked acoustic guitar busying against a rhythmic bass drum. The opening of the track should appeal instantly to those who’ve gorged on The Decemberists and Wilco, but with the addition of piano, it just gets better. A lead vocal is at once gentle and inviting which combined with a main hook that really allows reflection results in a strong performance. With time enough for a few Brian Wilson harmonies along the way and with music in that straddles indie, folk, Americana and 70s pop, it’s a genuine smorgasboard packed into just four minutes but, somehow, Shakked shows off a genuine gift for arranging this kitchen sink style without it ever appearing too forced or fussy. Going for full on retro, ‘The Way Back’ features a heavily reverbed vocal against a sparse electric guitar at the outset which will almost certainly call to mind Jack White’s solo works, while the guitar sound and general despair within the performance draws closer parallels with UK singer-songwriter Charlotte Carpenter. By the time it settles into the second verse, the listener is exposed to a melody that seems more robust, suggesting a track that gets better with time. Although often only used to punctuate the guitar strums, the bass is huge and the still sparse feel accentuates a the sense of unease within the performance. With regard to a chorus, this seems more concerned with building on the musical arrangement than anything particularly sing-along, but the sounds that emerge are great. Somehow Shakked has managed to create something that sounds like a Lennon-esque plod reworked by a twenty first century rock-pop band, but also actually make it worth hearing… The use of reverb here means this has very little in common with the rest of the EP (or indeed any of the performer’s past works) but it’s terrific nonetheless – an insight into a writer who’s unafraid to experiment or try new things. ‘Can’t Feel’ adds another dark slice of indie-pop that constantly teases with a repetitive lyric. Like ‘The Way Back’, it isn’t always quick to deliver a musical reward, but the arrival of swooning melodies midway off-set the rhythmic verse and add great interest. The track’s second half is even better: working in a piano riff – not to take the obvious lead but instead to punch through everything in an arty and disjointed manner – this goes from at first feeling like filler to sounding like something that adds something new to the EP as a whole. Hearing this for the first time is unsettling, almost as if M. Ward and Mark Everett were locked in a studio together. It might never reach the heights of the very best Shakked/Holmes work, but it’s certainly interesting. On the perkier side, ‘Shine Bright’ uncovers a world of punchy bass riffs, a funk inflected rhythm guitar and a few horns for good measure. Somewhere between twenty first century pop and 70s soul, the arrangement is one that seems to uncover something new on each listen, while Roy’s lead vocals glue various disparate musical elements in a way that makes this all feel so natural. There’s something about this song that sounds timeless. Perhaps more than anything, it will resonate with those who still love Paolo Nutini’s hit single – and career highlight – ‘New Shoes’. You’ll hear all kinds of retro pop squeezed into (and out of) these three and a half minutes, though, on a song that’s deserving of inclusion on many a summer playlist. Know Nothing’ knows it’s smart, but listeners shouldn’t necessarily expect to reap the musical rewards instantly. Once you’re in the zone, however, there’s a lot of enjoyment to be found within this very small package. There are so many influences packed into these fifteen minutes that it should be a mess. It’s to Roy’s credit – and years of experience as a producer – that it all works so well and often feels like more than the sum of its parts. The weaker moments still manage to reveal songs and ideas that lesser songwriters would struggle to bring to life, while the stronger tracks might even rank among career bests. Recommended. This entry was posted in Album & EP Reviews and tagged holmes, pop, power pop, roy shakked, singer songwriter, stream by Real Gone. Bookmark the permalink.